I am making a bar, but well its so far, and I wanted to ask for critique. That guy did well with the left part. DIRECTIONS: Take with grain of salt. This is my first critique. I think the wall was moved up to make room for that darker area, which appears to be a raised floor. It's not just a really tall wall. I recognized it right away, but maybe a shadow would make it more obvious? I don't know, RPG's in this style typically don't have shadows indoors do they? I noticed you're using 55 (!) colors. In my opinion that is excessive. Here's some quick palette reductions. Of course it can look better than this if you tweak it a bit afterward. I really like what IvanM did in his edit. Quick edit: Lowering contrast on the floor makes the other things more distinct even without outlines. Also, I added shadows for the stools and the suggestion of shadows where the back walls touch the side walls. I think there's an issue that you're detailing the tiles rather than the scene. 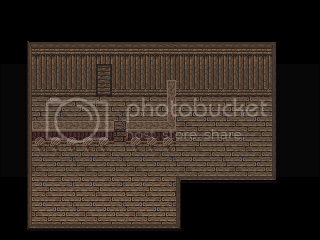 If this set is for a bar/pub/tavern/inn, or really any setting, try thinking of things that can go in it to add interest without adding pixel noise. * narrow front windows across an entire wall, or nearly so. * routinely built on a corner-lot, for 2 walls of windows. * soot from cigarettes, cigars, and in old times kerosene lamps or even candles depending - concentrated near the ceiling. * heating. these are warm places. a hearth should be found somewhere in any bar built pre-war, even if it's closed up. * coathooks and hathooks, generally under the counter in front of the barstools, as well as by the door. * boards stamped and pounded so hard you can only tell the cracks if they've been replaced or are otherwise a different color from the boards next to them. * pits, stains and scratches more visible than cracks or wood grain. * Straw and peanut shells on the floor - a necessity, grouped under furniture and in corners. * if there are cracks, they're actually lighter than the boards, because they're filled with pulverized bits of the above. * a particularly smooth, ashy ring in the largest standing area or most-used path of traffic. I can imagine a very engaging bar with very little texture/noise and even just half of these things. don't spend so much time on individual tiles, spend time creating an environment and then detail if you still feel the need to once that's done. Behind the bar, I suggest some shelves on the wall with bottles of alcoholic beverages. other walls could have paintings, advertisements, a coat of arms. Maybe put a piano on that raised area? Tables would also be good. Ahhhh, very good edit. Is the bit on the right a stage then? You could have a small piano (As said before) and maybe a guitar stand?